While seemingly every news source on the Internet is using the period between Christmas and New Years to rehash things that happened from January to December in an endless series of lists, there is still the glimmer of golf news. Among the stories out there is the split between the Nationwide Tour and the Canadian PGA. The two partnered on an event at Cambridge’s Whistle Bear Golf Club (but started at Clublink’s Diamondback) that didn’t really catch on with anyone, including the sponsor, Samsung. Of course it did benefit some players, like Canada’s Jon Mills, who used a win at the tournament to propel him onto the PGA Tour starting next week. The breakup of this partnership demonstrates just how difficult finding a sponsor for Canadian golf has become. AT&T withdrew from the Canadian Seniors event a number of years back; Bank of Montreal dropped its involvement with the LPGA Tour in Canada; and Bell Canada has yet to sign back on to put its name in front of the Canadian Open. A couple of years back, the current commissioner of the Canadian Tour, Richard Janes, thought he’d landed a European Tour event in this country until all the sponsors pulled away from the table. Some would argue Canadian companies need to step up and support golf, like CN did when it backed the LPGA a couple of months back. But what are they getting for their money? In Bell’s case, its millions are being spent on a deal that attracts fans, but fails to draw players. And the proposed deal to move the tournament to July and follow the British Open won’t likely help matters. Remember, a deal to renew the title sponsorship for the tournament was expected months ago. This is an issue that has gone strangely quiet as of late. Has BCE CEO Michael Sabia, a guy who likes to pound balls at Mount Bruno, decided it isn’t worth his company’s money to continue sponsoring the event? If that’s the case, who is going to step up? Rogers, which is already poised to lose millions on the Toronto Blue Jays? In marketing it is always about the bang you get for your buck. In the case of the Nationwide event, the bang wasn’t there. 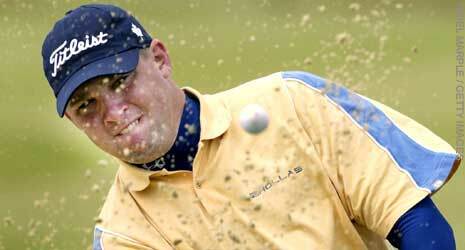 It remains to be seen whether the Canadian Open has the same problem. Though the magazine has been on the shelf for a while, here’s the web version of Golf Digest’s Best New Course in Canada feature. 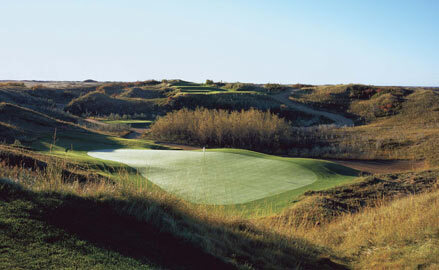 Golf architecture editor Ron Whitten makes some interesting comments about Dakota Dunes (right) that suggest maybe he wasn’t in complete agreement with its selection as best new in Canada. He notes that Graham Cooke’s associate on the project, Wayne Carleton, “manufactured all green sites, and though a couple might seem a bit artificial, others merge perfectly into their surroundings.” Artificial doesn’t sound like the most ringing endorsement, now does it? Whitten does make some nice remarks about Georgian Bay Club: “Some holes cross ravines, others edge lakes and streams, and a few play along bottom land. Some holes are bordered by trees, others by meadows of native grass. The one constant: elaborate, free-form bunkers, most quite deep, with shaggy edges of unruly fescue.” Interestingly, Georgian Bay Club apparently fired much of its staff a few months ago, apparently because of issues with the progression of its real estate sales. Nice course though. Maybe the Canadian Open should switch to being a European Tour event. Canada is much closer to Europe then some of the other European tour sites and the location could be a benefit for Europeans on their way to/from a major in the US.